REINA DEL PACIFICO of 1931. 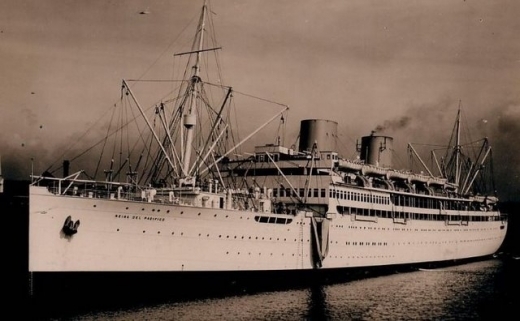 There was widespread regret on Merseyside at the end of 1958 about the news of the final disposal of the familiar REINA DEL PACIFICO, even though her later years were marred by a series of unfortunate incidents which brought her into the popular press with uncanny regularity. Throughout her pre-war career she gave excellent service and the same could be said for her role as a troopship. Completed in 1931 by Harland & Wolff at Belfast, the REINA DEL PACIFICO quickly made a great name for herself for comfort and reliability. On her completion she was of considerable interest due to her method of propulsion: she had quadruple screws each driven by trunked piston 12-cylinder oil engines working on the single-acting four-stroke principle. She had four auxiliary engines besides, each driving a dynamo and accommodated in a separate engine room, divided from the main one by a watertight door. 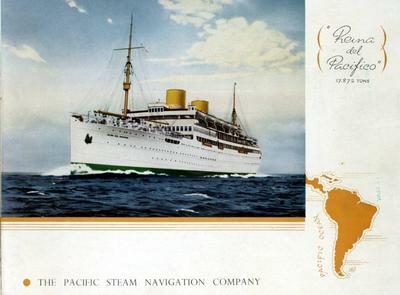 The REINA DEL PACIFICO was launched on 23rd September 1930, and she became the largest vessel to date in the fleet of the Pacific Steam Navigation Company. She was the first of the company's ships to be given a white hull, and the first of its passenger ships to be given a name that did not begin with 'O'. The new liner's two funnels added to her appearance, but the forward one was a dummy. way to the 'shake-down' cruise in the North Sea on 1st April, 1931. 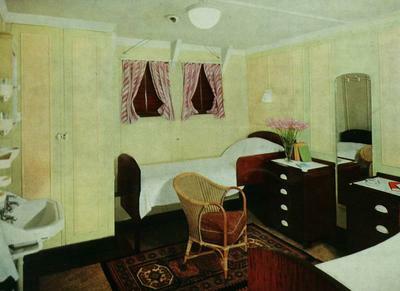 As far as the passenger accommodation was concerned, the REINA DEL PACIFICO provided a new standard of luxury in the South American trade. On completion she could carry 800 passengers in first, second and third class accommodation. 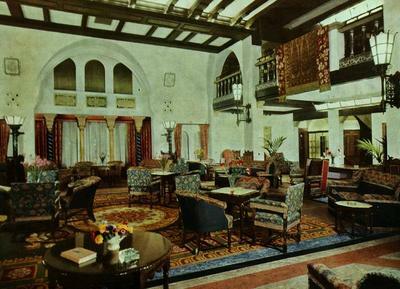 The public rooms were decorated in Spanish designs of the Moresque and Colonial periods. Before commencing her maiden voyage to South Africa, thenew REINA DEL PACIFICO made a three-day shake-down cruise to the North Sea with company guests on board. 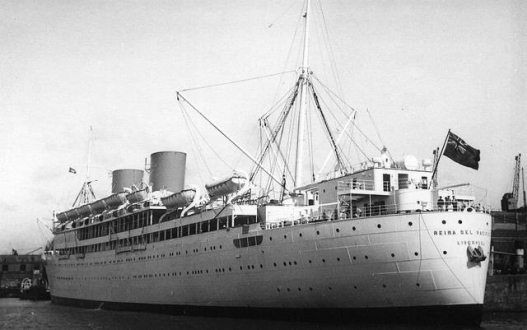 Her maiden voyage on her intended route left Liverpool on 9th April 1931, calling at La Rochelle, Vigo, Bermuda, Bahamas, Havana, Jamaica, Panama Canal, Guayaquil, Callao (19 days); continuing to Antofagasta and Valparaiso (26 days). 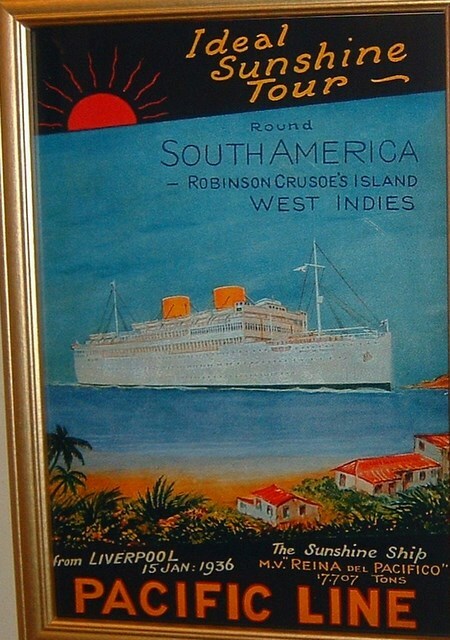 On 19th January 1932 the new Reina commenced her first annual 'Round South Africa' voyage. Her record passage from Liverpool to Valparaiso in just under 25 days was made in 1936. 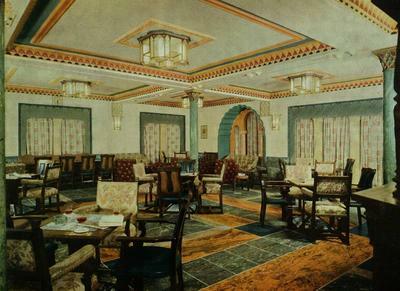 In 1937 Mr Ramsay MacDonald died on board the REINA DEL PACIFICO whilst on a holiday voyage to South America. 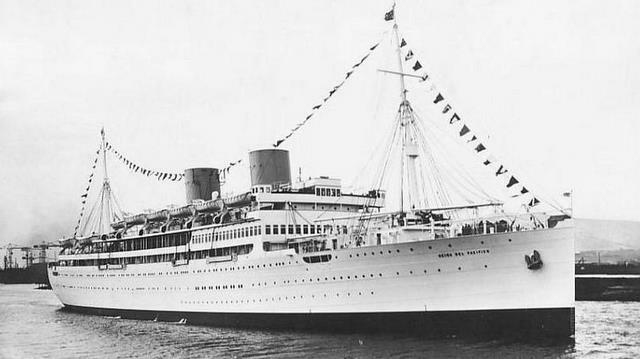 The REINA DEL PACIFICO was taken up for trooping service just before the outbreak of the Second World War, and her first voyage in this capacity was in the re-arrangement of overseas garrisons: she sailed from the Clyde for Singapore, and afterwards brought the first Canadian troops to Britain. 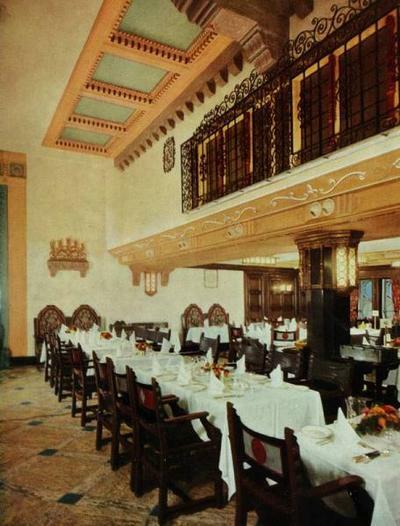 on board the REINA DEL PACIFICO in 1937. On more than one occasion, the enemy claimed to have sunk her, but these reports, like the premature report of Mark Twain's death, were greatly exaggerated and she continued her trooping service mainly on long distance routes. The REINA DEL PACIFICO rushed troops to Norway in April 1940, and as quickly evacuated them a few weeks later. On her arrival at Bygden Fjord she steamed around in circles at full speed for two hours whilst the fjord was depth-charged by her escorts HMS FEARLESS and HMS BRAZEN, forcing U-49 to the surface. 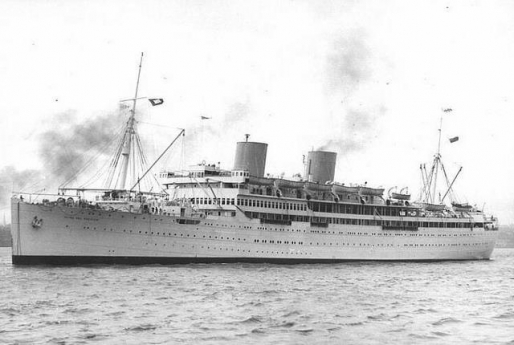 After that the Reina was employed mainly in the Middle East, and escaped damage in the Red Sea when under attack from Italian aircraft. On occasions she averaged well over 20 knots for twenty-four hour periods. In 1941 she was taking troops from Halifax, N.S. to Singapore by the wetbound route, but the following year she was converted into an assault ship to take part in the French North Africa and Sicilian landings. 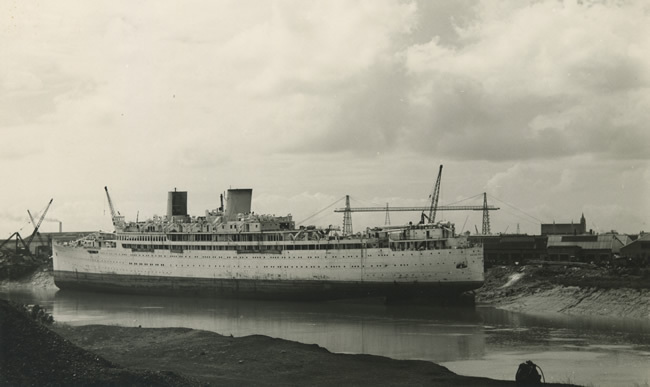 At one time in her wartime career the REINA DEL PACIFICO was at Avonmouth when that port was subject to a heavy air attack. She was straddled with high explosive and incendiary bombs, but again escaped without damage. On another occasion while lying at anchor in Walton Bay in the Bristol Channel she was bombed, and had a similar experience at Liverpool where a delayed-action missile exploded in the dock alongside, but her luck held and the only damage she suffered was to crockery. On 21st October 1942 the REINA DEL PACIFICO embarked troops for the 'Z' landing at Oran. She was flagship to the Senior Naval Officer Landing. The Algiers force had to be twenty-four hours ahead of the Oran force, so that at one stage the Reina had to steam back on her tracks for eight hours in order to pass through the Strait of Gibraltar in darkness. 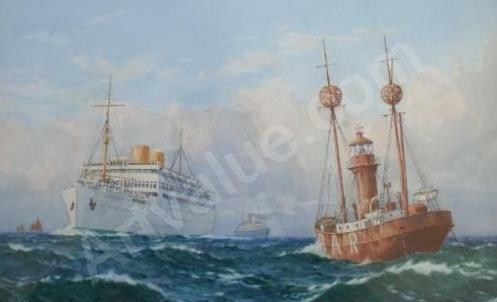 At 3.30pm on 7th November 1942, the REINA DEL PACIFICO met up with the equipment ships off Oran. She was on time to the minute, and at 7.am the following day her landing craft took her troops ashore. Later the Reina berthed in Oran harbour. In 1943 the REINA DEL PACIFICO was off Gibraltar when she was attacked by German aircraft on two successive days but no hits were scored. German radio reported that the Reina was 'torn to pieces and disappeared in a few seconds' ! 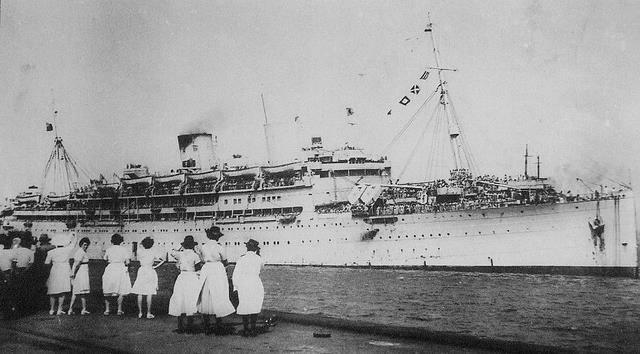 After the Sicily landings the REINA DEL PACIFICO took King Peter of Jugoslavia and his staff to Port Said, and then sailed on to Taranto with troops. Following the Italian campaign she was once more used on long-distance hauls carrying troops of all nationalities. The Reina was next placed on repatriation duties to and from the Middle East. The ship's astonishing good luck during her wartime voyaging might very well be said to have given the lie to the stories that went round in her final years that she was a 'hoodoo' ship. The REINA DEL PACIFICO's sinister record began in 1947 when she was the subject of a serious crankcase explosion on 11th September whilst on trials off Copeland Island in the North Channel, after being refitted at her builder's yard at Belfast, before re-entering commercial service. The explosion caused the deaths of twenty-eight members of her crew and the PSNC's technical staff. The vessel returned to Harland & Wolff's Belfast yard and was eventually put back on her peacetime service to the West Coast of South America about a year later. 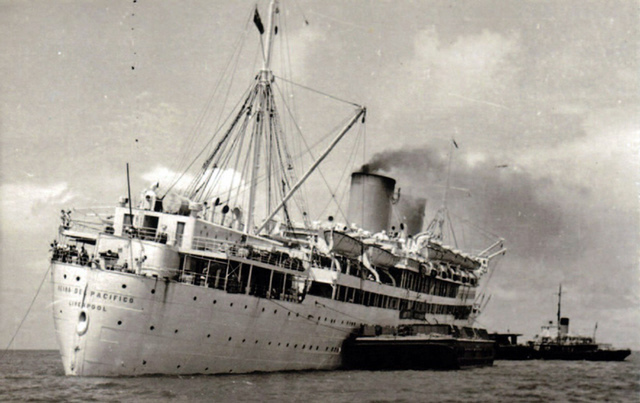 She opened the first British-operated express liner service between Britain and Colombia by introducing regular calls at Cartagena into her schedule. A Court of Inquiry was held at Belfast in April and May 1948 to investigate the cause of the explosion, and its findings were published on 5th June 1948. The primary cause was found to be the piston of No.2 port outer engine overheating and igniting an inflammable mixture present in the crank chamber of the said engine. It was stated that nine days prior to the explosion, a previous sea trial on 2nd September was abandoned because of serious overheating on the port outer cylinder liner. The REINA DEL PACIFICO at anchor in mid-Mersey off the Pier Head. In the foreground is Birkeanhead Woodside ferry terminal. There then followed a series of minor incidents- engine trouble and the like - which culminated in the grounding of the ship on Devil's Flat, Bermuda, on 9th July 1957. With 400 Liverpool-bound passengers on board, the REINA DEL PACIFICO was aground on sand, listing some twelve degrees to starboard. A spokesman for the PSNC said in Liverpool: "We have received no message that would in any way suggest the ship is in danger, Captain E.C. Hicks has reported that the liner is not taking on any water. It is expected that the REINA DEL PACIFICO will be refloated on the next high tide." However, this was not to be. The US Coastguard cutter CASTLEROCK joined two local tugs in refloating attempts.. The passengers were retained on board because it was considered too risky to land them ashore by tender, and because of difficulty in finding hotel accommodation for them. Two days after the grounding, cargo and fuel oil were being discharged from the stranded liner, and ground tackle was laid down to assist in a further refloating attempt. Over 22 tons of salvage equipment was air-freighted to Bermuda. The REINA DEL PACIFICO was successfully refloated in the early hours of 12th July, Steel hawsers were passed under the hull and attached to ballast tanks on each side of the vessel. The tanks were then filled with compressed air. The list had been reduced to just four degrees by the removal of cargo and fuel oil. Three lines attached to anchors were dropped near the stern and connected to capstans on the vessel's stern. Each of these lines, according to salvage experts, supplied leverage equal to the pulling power of four tugs.. Heavy steel rollers, flown in from England, were placed on the reef. The local tugs JUSTICE and BERMUDA took the strain of pulling the REINA DEL PACIFICO into deeper water. After being successfully refloated, the Reina moved to an anchorage in Grassy Bay, in the Great Sound at Bermuda, so that 700 tons of cargo could be reloaded. 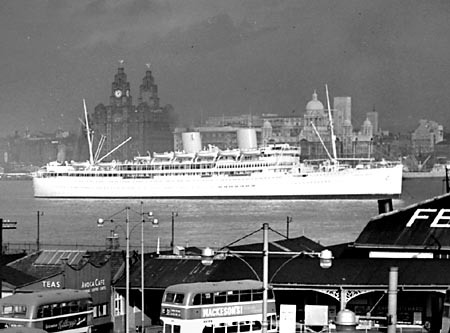 The REINA DEL PACIFICO resumed her passage to Liverpool on 14th July and arrived back in her home port on 24th July 1957. 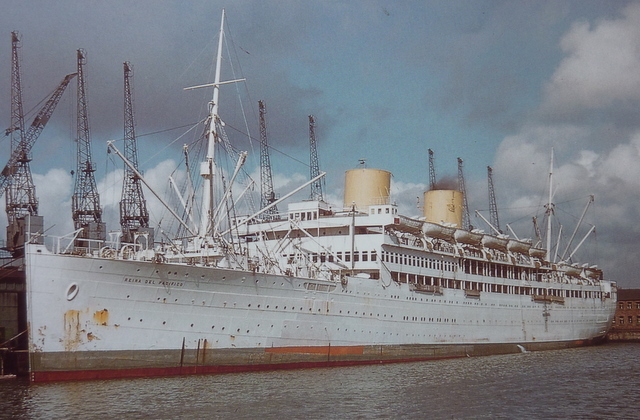 On her next voyage, after leaving Liverpool on 15th August 1957, the REINA DEL PACIFICO had to put into Milford Haven with generator trouble and it soon became clear that she could not be repaired in time to complete the voyage, which was cancelled. The Reina returned to Liverpool for major repairs to her generating plant. 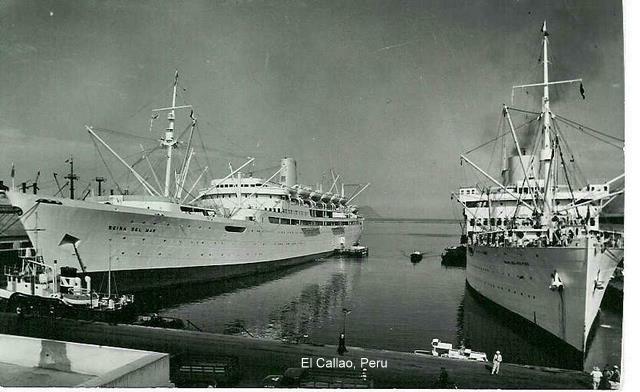 A rare photograph of the two 'Reinas' in port together at Callao, Peru. PACIFICO is on the right. 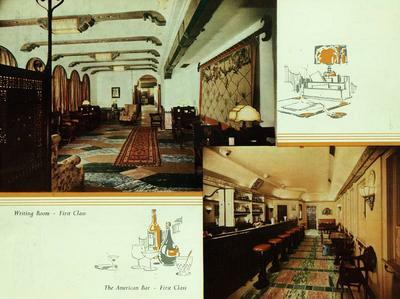 May, 1957. On 10th November 1957 the REINA DEL PACIFICO dropped her starboard inner propeller whilst manoeuvring in Havana harbour (Cuba). 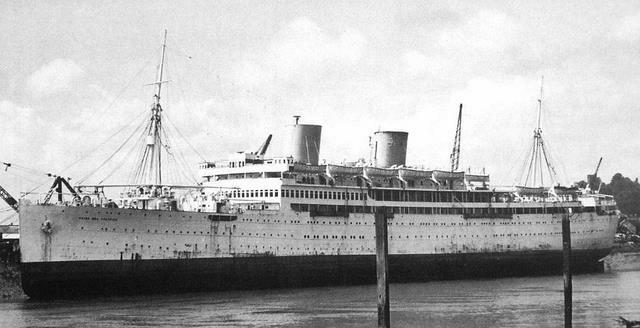 The liner continued her voyage at reduced speed on the remaining three propellers, calling at Kingston, La Guaira, Cartagena and Cristobal, before passage through the Panama Canal to Balbao where she was drydocked to have a spare propeller fitted. This spare had been shipped out to Panama in the motorship SALINAS, another PSNC vessel. the REINA DEL PACIFICO is seen here in the locks at Liverpool. 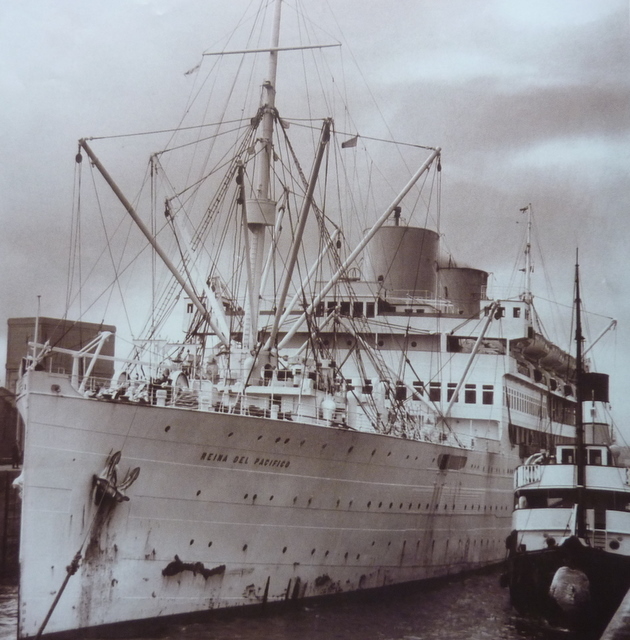 At the end of March 1958 it became clear that when the REINA DEL PACIFICO reached Liverpool at the completion of her voyage she would be withdrawn from service. At that stage it was not clear what was intended as far as the ship's future was concerned, although it was obvious that she would be offered for sale. 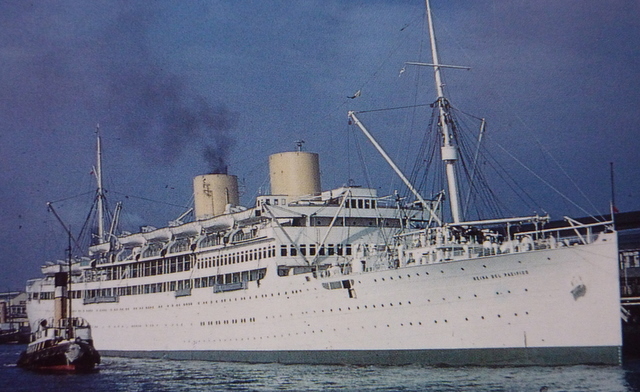 The Reina arrived at Princes Landing Stage at the end of her final voyage on 28th April 1958, and the Pacific Steam Navigation Company's managing director, Mr H. Leslie Bowes, commented: "This ship has been a great asset to the Company, and despite all these 'Jinx Ship' stories, has been exceedingly well liked." Liverpool on completion of another voyage. Whilst lying at Liverpool awaiting disposal, negotiations were taking place for the old ship's sale to Japanese shipbreakers, but this deal fell through and the REINA DEL PACIFICO was eventually sold to the British Iron and Steel Corporation (Salvage) Ltd., London. When she left the Mersey for the last time, the REINA DEL PACIFICO was bound for Newport, Mon., to be scrapped by the shipbreaking firm of John Cashmore Limited. John Cashmore's yard at Newport, Monmouthshire, in May 1958. The war in Europe had only a few weeks to run when I joined the REINA DEL PACIFICO at Liverpool. I was a humble writer in the Royal Navy at the time and I was in the habit of scribbling daily entries into a spiral-backed notebook that I kept in my kitbag. With several hundred other officers and ratings I had travelled through the night from Devonport barracks by special train. As our coaches had been shunted down to Riverside Station at about 10.30am, railway and dockside workers waved us 'farewell'. Then we saw our home for the next few weeks - the REINA DEL PACIFICO - looming over the landing stage, her hull painted a dull grey and streaked with rust after five years of war. 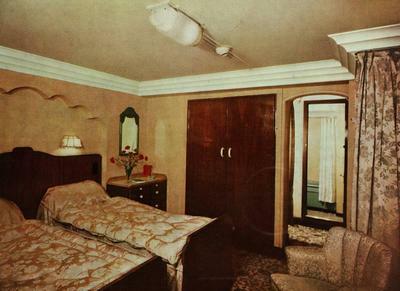 Our quarters, on the waterline, were rather overcrowded as the Reina was carrying 2,500 passengers this trip. 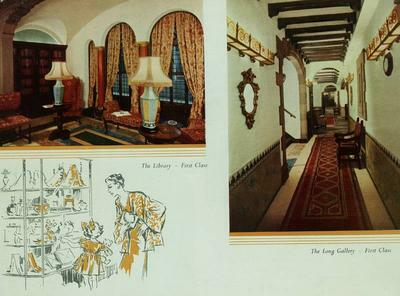 There was little sign of the charming Spanish and Moorish interiors which had graced tourist travel in pre-war days. At 7.45pm on 15th April 1945 we pulled away from the landing stage and then lay in mid-Mersey overnight. I joined an informal football match on the after end of 'E'-deck before going below, queueing with my tin mug for a special ration of grog from the rum bosun, and then slinging my hammock over a linoleum-topped mess table. There were 'emergency stations' next morning, each man wearing a blue lifebelt and red safety light, and at 1.pm we steamed down the Mersey with other ships, including several American tankers, before anchoring off New Brighton for another night. On 17th April the REINA DEL PACIFICO hoisted pennants and steamed out of the Mersey, past the protruding masts of the ULLAPOOL and the TACOMA CITY which had been sunk by mines earlier in the war. With us was a mixed batch of tankers, cargo steamers, troopships, a destroyer and two frigates; all proceeding in line ahead with the Rock Lighthouse abeam, and then forming two columns when clear of the swept channel. Several more vessels were waiting to join us at the Mersey Bar. 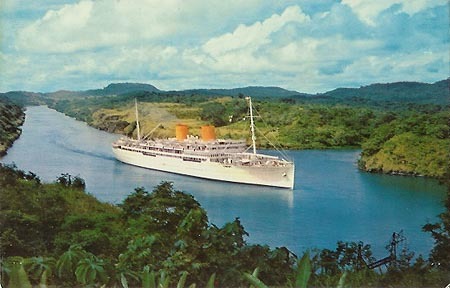 The REINA DEL PACIFICO formed part of convoy KMF43, which turned out to be one of the last escorted convoys to leave the shores of Britain in the Second World War. We were guarded by the destroyers ESCAPADE and ICARUS, the frigates LOCH KATRINE and NESS, and the corvette OXFORD CASTLE. We steamed at about 13 knots. Morning mist was followed by afternoon sunshine. There was a long steady swell and I swiftly succumbed to a short, sharp bout of seasickness. I obtained a couple of tablets from the sick bay and retired early to my swinging hammock. The fourteen ships being escorted towards the southern Irish coast, and then south to Gibraltar, were in columns with a gap of three cables between each ship. The REINA DEL PACIFICO ploughed through calm seas, immediately astern of the CAPETOWN CASTLE which was carrying 3,200 men to India. To starboard was the GEORGIC with 3,850 troops for Malta and Egypt, followed by the SAMARIA with 3,450 men for Italy and India. The third column was led by the ALCANTARA (3,700 troops and airmen for Algeria and Italy), and HMS PRINCESS BEATRIX, a former Harwich - Hook ferry and a veteran of the North Africa landings, astern. 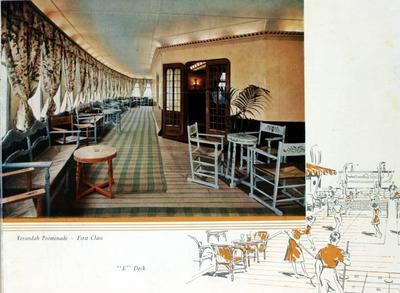 The convoy commodore, Sir Arthur J. Baxter, was on board the liner ORION. On 19th April several of the ships in the convoy held a thirty minute exercise for their gun crews, the 40mm Bofors gun on the BEGUM providing the most impressive show. There was some excitement in the early hours of 22nd April when the 'river'-class frigate NESS dropped a pattern of depth charges at a suspected submarine contact. The Clyde-based escorts ESCAPADE and NESS were relieved at Gibraltar on 20th April as our convoy entered the Mediterranean. When the Rock hove into view through a blanket of haze, all the ships steamed into the roadstead. After an exchange of signals, Captain J.V. Longford of the REINA DEL PACIFICO ordered speed to be increased to 15 knots and we headed east, alone, through the Mediterranean. Sun awnings and canvas air chutes for the engine room were erected. 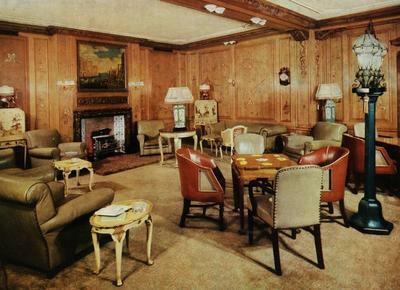 Many of the Navy passengers lolled in the sunshine on 'D'-deck, reading tattered books and magazines from the ship's limited library. We had a medical examination and then washed our uniforms with rubbery soap in buckets of sea water, and fitted white covers to our caps. I leaned over the bow to watch the graceful porpoises keeping pace with the ship which was vibrating considerably at her increased speed. On 25th April we passed the island of Pantelleria with its high cliffs. There was tombola on 'E'-deck - £15 for a full house - but I was unsuccessful. A ship's concert was held in the evening. Captain Longford steamed a smoke float the following morning and gave the Royal Navy gunners an hour's practice. The Reina zigzagged to let the Bofors gunners aft have a fair share. Our biggest gun, in the stern, proved the most accurate, hitting the target several times at ranges of up to two miles. Then rocket-fired crimson parachutes floated in the blue sky as the midships Oerlikon cannons blazed away. Everyone on board was delighted, not least a party of WRENS leaning over the rails on the upper deck. Later in the week I had to queue for a haircut from a leading stoker in the next mess. Another concert was held, but the noise from the Reina's overworked ventilation plant made it difficult to hear what was going on. The concert ended with the massed singing of Just a Song at Twilight as a silvery moon floated over the distant coast of Egypt. There was a commotion on 27th April when a fire broke out in the stern galley. Smoke and fumes spread for nearly an hour before everything was brought under control. When I went on deck the next morning we were steaming slowly past the waterfront at Port Said, taking our place in a convoy of vessels making its way through the Suez Canal. Water and fuel boats came alongside when we reached Suez. Egyptian 'feluccas' with high lateen sails arrived to conduct business with fezzes, handbags, wallets and belts. Baskets were used to haul the goods to the Reina's decks and the lissom, brown merchants climbed their masts to bargain with us. At 6.pm we weighed anchor and set off down the Red Sea. Blackout restrictions were lifted and everyone was ordered into white tropical rig. I was appointed mess cook and had to scrub the deck and scrape clean the garbage bins in the sweltering conditions below. There was more laundry work, using sea water not very successfully, but there were fresh organges for supper and these made a welcome change from our almost unchanging diet of tinned pilchards. We were soon in the Arabian Sea and had our first sight of flying fish skimming over the smooth water. I went to a 16mm film show on 'E'-deck - seeing The Wicked Lady for the third time - whilst the officers and WRENS danced on the floodlit boat deck. There was another ship's concert on 7th May and at the end Captain Longford informed everyone to rousing cheers that the end of the war in Europe had just been announced. We sang Land of Hope and Glory lustily as the REINA DEL PACIFICO sped on across the Indian Ocean. I was scrubbing the messdeck when the Reina passed the breakwaters at the entrance to Colombo Harbour at 9.am on 8th May, V.E.-Day. The town of white, red-roofed buildings seemed to be celebrating. 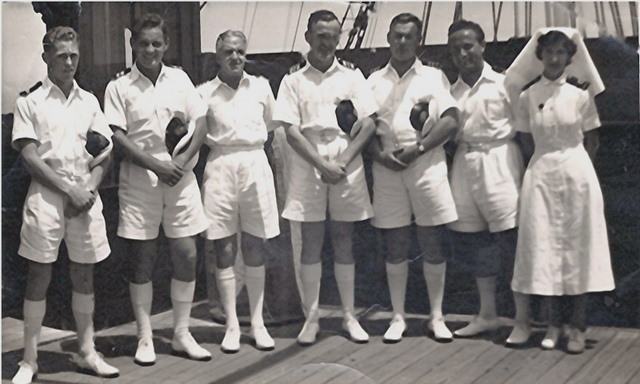 The Officers, WRENS and Royal Marines disembarked, but most of us were confined to the ship and bought pineapples and coconuts from the Sinhalese traders who came alongside in droves. A supply of beer - one bottle per man - was brought on board. As darkness fell at 7.45pm, Winston Churchill's voice came over the loud speakers. The REINA DEL PACIFICO's deep syren joined the shrieks and screams of every other ship in the harbour. Throughout the night searchlights blazed, rockets were fired and flares ignited. The cruiser CLEOPATRA, moored close by, hoisted a mass of fairy lights across her forecastle.